(Broomfield, Colorado) – June 19, 2017 – Phonesuite, a leading provider of communications solutions for the hotel industry for more than 25 years, today announced that it is responding to consumer demand for "anytime, anywhere" communications by debuting new mobile integration technology at HITEC 2017. Phonesuite customers will now have the ability to download a free, SIP-compliant app to their smartphone that integrates with the Phonesuite IP-PBX , enabling hotel staff to communicate seamlessly without the need to be tied to the desk phone. With mobile integration technology, hotels can leverage the Phonesuite hotel PBX to add unified communication features and further differentiate themselves in the way they communicate with and serve guests. Utilizing the app, hotel staff can map their extensions through their mobile devices, gaining freedom in how they communicate, rather than relying on the desk phone, and without the worry and expense of utilizing cell data. Phonesuite CEO Frank Melville stated, "We are excited to deliver yet another game changing tool that continues our commitment to allow hotels and their guests to take control of when, where, and how they communicate. 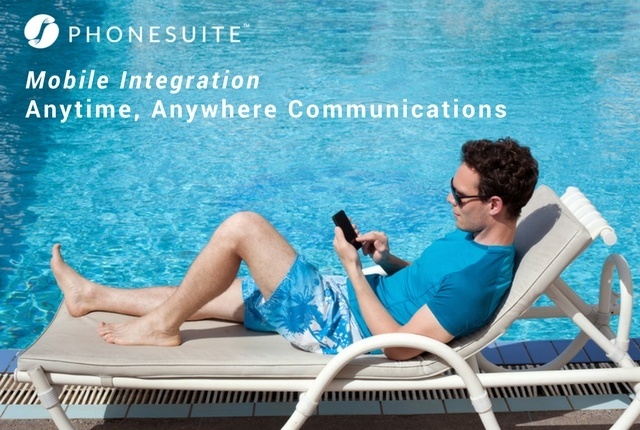 Just as our mobile device integration platform removes physical barriers in hotel communications, Phonesuite will continue to break telecommunications barriers by delivering revolutionary yet cost-effective tools and solutions that seamlessly integrate with our hotel PBX to help customers enhance their operations and communications. Be sure to visit our HITEC booth for a demo!